Christmas is a holiday celebrated around the world by millions of good little (and big) boys and girls. 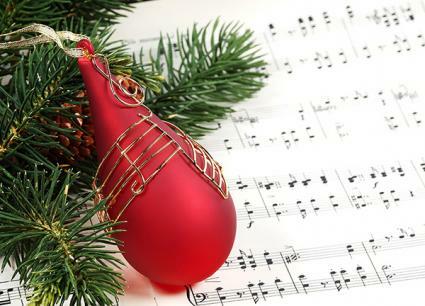 The Christmas spirit carries on all year, however, thanks to the Internet's vast resources of seasonal music. From traditional carols like Jingle Bells and We Wish You a Merry Christmas to more modern, original holiday sounds, it's never too early to break out the milk and cookies for Jolly Saint Nick. Angels from the Realm of Glory Recorded in 1916 on cylinder and acetate technology, this version that features bells, horns, and a choir is a true piece of history. Although digitally restored, it has not lost its vintage feel. Angels We Have Heard on High Famous rock band Sixpence None The Richer, the band that wrote the hit song Kiss Me, offers a stirring version of Angels We Have Heard on High. The angelic voice of Leigh Nash gives this free track an ethereal, beautiful quality. Indie artist The Layaways have been kind enough to record Christmas classics and offer them for free. This unique instrumental version features a guitar lead soaked in reverse digital delay effects. This stunningly beautiful version of Away in a Manger features singers from England's Peterborough Choir as well as the London Telefilmonic Orchestra. Dance of the Sugar Plums This bonus track from Christmasgifts.com presents a classic performance of Dance of the Sugar Plums, complete with the magical bells that make this track instantly recognizable. To download, right-click on the title of the song in the left column and then save as mp3. This irreverent, comical version of Deck the Halls features the Chipmunk-like voices of The Swirrels. This stripped-down hipster folk version of this popular song features a male and female vocalist singing over a simple but well-played bed of acoustic guitar layering. If that's not cool enough, it has a flute solo during the bridge. This rustic arrangement of a classic melody includes Appalachian-styled instrumentation that features a dulcimer and beautifully arranged strings. Recorded over 100 years ago, this 1907 recording of a horn choir and a male vocalist comes complete with the crackling vintage sound quality that matches the mood of a warm crackling fire on Christmas Eve. The British geniuses over at the Peterborough Cathedral have turned this melancholy Christmas song into a tear-inducing masterpiece with elegant classical guitar accompaniment and a beautiful tenor voice that floats peacefully in the stillness. The irresistible angelic voice of indie jazz singer Ann Alee turns this classic Christmas melody into a gem that could stand on its own alongside any jazz standard ballad. Jingle Bells (slow mix) This slow version of Jingle Bells takes the familiar, happy melody and mellows it out into a peaceful violin arrangement. Jingle Bells (historical recording) It's hard to believe, but this recording was made in 1898 and pressed to an Edison brown wax cylinder. When it was discovered, it was faithfully preserved and eventually transferred into a digital mp3 format. This is the earliest recording of Jingle Bells known to exist, and it comes with comical spoken parts. Jolly Old St. Nicholas This fun track by Chuck and the Chuckleberries adds a joyful, light-hearted feel to the mix of free Christmas songs available online. This 1920 recording features some of the earliest Christmas radio theater with a dramatic reading of Night Before Christmas. In an era of silent films and no television, this holiday recording was popular in the roaring twenties. O Christmas Tree Another seasonal offering from the indie group The Layaways, this might be one of the hippest versions of O Christmas Tree ever recorded. The breakaway drum beat will make you nod your head in time and tap your toes without realizing it. A beautiful, haunting piano performance, this instrumental track captures this famous melody in a sparse, peaceful arrangement. One of the oldest Christmas recordings to exist, this 1907 recording features the Edison Concert Band playing this festive Christmas melody. This simple, traditional version of Silent Night features soothing harp and flute. The Layaways have managed to take Silent Night and transform it into a well-executed instrumental U2 ballad similar to the style of With or Without You. For rock fans, this track is a must-have. Silent Night (8-bit version) And now for something completely different: a rendition of Silent Night done in a full-blown 8-bit Nintendo video game style. This hipster indie version of The Christmas Song by The Ravonnettes is charming and hard to resist with its subtle retro feel similar to She and Him. Another entry in the 8-bit video game world of Christmas music, this track takes the wonderful melody of The First Noel and blasts it out of this world as if it were the music for a MegaMan level on Nintendo. Up On the Housetop Another fun offering from Chuck and the Chuckleberries, this track captures the child-like joy of the classic Up on the Housetop. This bombastic version by the United States Marine Band adds power and majesty to this common Christmas carol. White Christmas This spirited up-tempo version of a classic is the perfect conclusion to this list of free Christmas downloads. Done in a brisk but soothing jazz choral style, this track will have your toes tapping and your heart soaring with the nostalgia of one of the most beloved Christmas songs of all time. Once you get to the homepage, right-click on "Download White Christmas" and "Save As" an mp3 to your computer. ReverbNation: This large network of independent recording artists includes dozens of acts who have covered well-known Christmas songs and have made some available as free downloads. Because each artist regularly updates their content the songs available can change each day, which makes ReverbNation a fun site to check on a frequent basis. Go to the home page and click on the song title in blue. Options for performances of the song will come up. Choose one, and it will then give you file options such as mp3 or MIDI. Right-click the one you want and click "Save As" for the chosen file type to download the song to your computer. These two sites could provide hours of musical exploration as you listen to Christmas music written and performed from all over the world. People who aren't the biggest fans of Christmas music often point out how repetitive some of the traditional pop Christmas songs can be during the holidays. The list above however shows how diverse and fascinating Christmas music can be. Whether it's Thomas Edison's band making one of the first Christmas recordings in history or it's an indie rock group putting a hip new spin to a classic song, Christmas music can be as entertaining and original as any music genre.